Vietnam Motorbike Tours Tripadvisor Certificate of Excellence is a prestigious award that any tour operator or service provider wants to achieve. 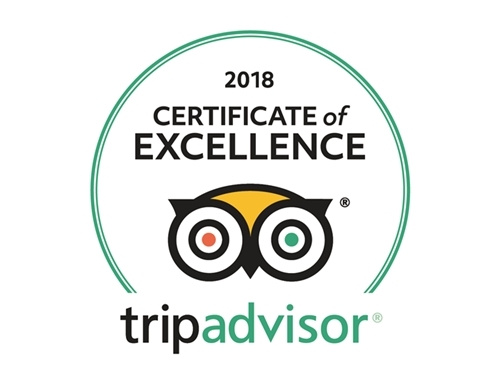 Adv Motorcycle Tours & Dirtbike Travel feels so proud and happy to receive the certificate of Excellence 2018, thank you to all customers for your outstanding reviews on TripAdvisor over the past 7 years. This certificate is a reflection of all the hard work our staff and management board have put in since establishment. We are always making an effort to provide the best service. All are for our customers’ highest satisfaction. To celebrate this occasion and to express our great thanks for our customers trust and support, Adv Motorcycle Tours & Dirtbike Travel would like to OFFER a 15% DISCOUNT for any return customers and 10% DISCOUNT to any new customers who go in group from 2 booking tours with us from June 2018 to December 2018. Our Management board is constantly looking for new ways to make our products and services become different from others and absolutely match with the demand of our customers, including strong investment in all categories like: Bikes, Guide training, Routs, and Mechanic to ensure every tour runs smoothly. Regard to our tours: We provide the hardest off-road tours in Vietnam. Our tours are definitely unique, special and varied. All are well built basing on our customers experience, and how much they wish to be challenged. Our target is always staying on the top list of motorcycle tour organizers in Vietnam. Regard to vehicles: Bike is a very important factor contributing greatly to the success of any motorcycle tours, especially with off-road tours. So, we only use the new or like-new motorbikes of the prestigious brands such as Honda, Yamaha or Kawasaki. The bikes are checked and maintained regularly, modified to suit the most difficult terrain in Vietnam. Tires we only use Dunlop or equivalent. Regard to our guides: Our guides are young, enthusiastic, knowledgeable, friendly and humorous. They are all well-trained at least 1 year and have to know well our routs before becoming the leader of the tour. Besides, they all best take care of customers, can fix the bikes and have skill to handle all unexpected risks happened on the way. If you take your time reading the reviews on Trip Advisor – no complain about our guides, all are compliments. Regard to customers services: All emails from customers have fast reply within 24 hours because we do not want our customers have to wait for long. We are always beside you before, during and after the tour. So, if you have any questions, or you need any helps, please do not hesitate to ask us, email us, or call us. Last but not least, this Vietnam Motorbike Tours TripAdvisor recognition will help our customers identify and confidently book our tours in the near future.